The recent leaks of scripts and footage from the new Doctor Who series were due to a "damaging mistake", according to the BBC's commercial arm. In a statement BBC Worldwide apologised to the sci-fi show's makers and said disciplinary action would be taken. The leaks resulted when five scripts from the series and unfinished scenes from six episodes were placed in a publicly accessible area online. The new series begins on BBC One on 23 August. 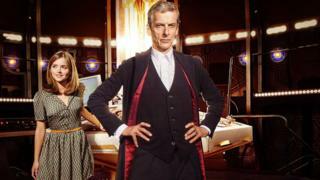 It will see Peter Capaldi make his full debut as the Doctor following his brief introduction in last year's Christmas special. The leaked scripts and footage are believed to have originated from a BBC Worldwide office in the US. "BBC Worldwide has taken this issue extremely seriously and disciplinary action has been implemented as a result of the incident," the statement continued. "While there is still a risk that this leak will result in more of this content emerging, so far the impact has been contained." The corporation's global arm thanked Doctor Who "devotees" and moderators of fan sites, who it said had "actively protected the programme". It offered "sincere" apologies to executive producer Steven Moffat, "the cast and production team who toil long hours to make the show in Cardiff... and of course the fans who expect so much better". The first episode of the new series will have its first screenings in Cardiff and London on 7 August and will be followed by a pre-transmission world tour.